Today, tomorrow, next week, next year… sometime in the coming decades… our planet could once again be hit by an intense volley of Galactic cosmic rays. It will come cloaked and hidden from us, until the very moment it strikes. We live on the edge of a galactic volcano. Knowing neither the time, the magnitude, nor the severity of the next eruption or its impact on our environment, we stand unprepared to deal with this event, much less anticipate its arrival. When cosmic rays from Galactic superwaves impact the Earth’s atmosphere, they produce “electron cascades.” Each primary cosmic ray generates millions of secondary high energy electrons. Many of these particles scatter upwards and become trapped by the Earth’s magnetic field to form radiation belts similar to those created by high altitude nuclear explosions. In just one day, a major Galactic superwave event would inject into the geomagnetic field a particle energy equivalent to 1000 one-megaton hydrogen bomb explosions (1025 ergs). At this rate, the energy delivered to the belts after one year would exceed 30,000 times the energy received from the most powerful solar cosmic ray storms observed in modern times. Such energized radiation belts could cause a global communications blackout by creating radio static and by permanently damaging critical electronic components of communication satellites. Air travel during such conditions would be extremely hazardous. The resulting atmospheric ionization would destroy the ozone layer, and increase skin cancer rates, due to high levels of UV reaching the Earth’s surface; the cosmic ray particles penetrating to ground level would significantly increase cell mutation rates. Galactic superwaves may also produce an intense electromagnetic pulse (EMP) whenever a cosmic ray front happens to strike the Earth’s atmosphere. Galactic superwaves such as those that arrived during the last ice age could have generated pulses delivering tens of thousands of volts per meter in times as short as a billionth of a second, comparable to the early-time EMP signal from a high-altitude nuclear explosion (see Figure 7). In addition, there is the danger that a superwave could transport outlying cosmic dust into the solar system which could seriously affect the Earth’s climate possibly triggering a new ice age. Although there is a small probability that the next superwave will be as catastrophic as the one at the end of the last ice age, even the less intense, more frequent events would be quite hazardous for the global economy. Figure 7. 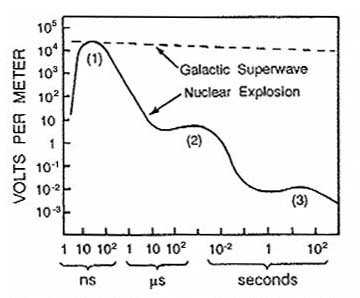 Intensity vs. time plot for EMP from a high-altitude nuclear explosion (solid line) compared to that from a hypothetical superwave (dashed line). The numbers designate early-time, intermediate-time, and late-time EMP phases (ns = nanoseconds, µs = microseconds). 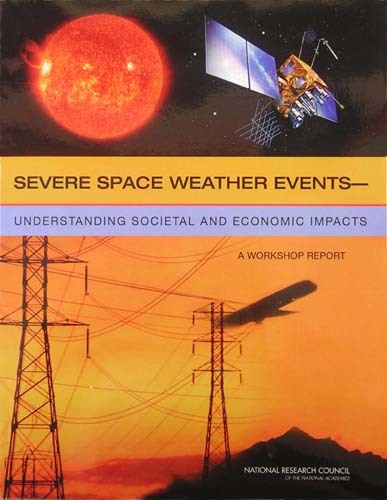 In March 2009, the U.S. National Research Council published a report entitled Severe Space Weather Events: Understanding Societal and Economic Impacts; see also March 2009 New Scientist for a summary. 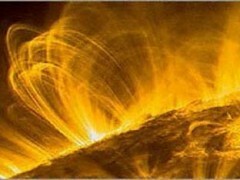 It describes hazards to modern society that could occur should we experience a large magnitude solar storm, similar to the 1859 Carrington event solar flare. Many of the adverse effects the report describes are the same as those that would occur during the arrival of a superwave, even one of relatively low magnitude. The four-second extragalactic gamma ray burst that arrived in 1983, did have a measurable effect on radio transmissions used for global navigation and communication. (20) By comparison, the “minor” superwave events discussed above might have total energies hundreds of millions of times greater than this.